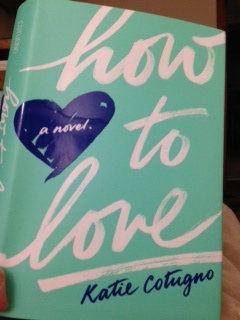 I saw How to Love: A Novel at NEIBA13 last week, and something about the cover just grabbed my attention. The story inside more than delivered, keeping me up past midnight as I raced through the pages. Reena is a girl in love with a boy named Sawyer, and the book alternates chapters between before and after she has his baby. The story is fast-moving and urgent, and captures the feelings of alienation, fear, hope and doubt that come with the transition from high school to the world beyond as well as anything I’ve read. I read this novel in two big gulps over a weekend. Highly recommend if you’re looking to escape into a compelling story. This entry was posted in Book Recommendations and tagged How to Love, Katie Cotugno, NEIBA on October 13, 2013 by Trish Ryan.